The three themes of CCTR will be approached with a general conceptual model in which the technological building blocks will be embedded. This model is presented in the figure below. Central in the model (left in the figure) is the patient, who receives feedback and advice or instructions on the basis of measured data. This can be direct body-functioning related data, gathered with different diagnostic sensors, but also ‘indirect’ data obtained from contextual sensing in the patient’s environment. The figure shows that, in general, three feedback loops can be discerned to enable the patient to become aware of his or her health status, and of possible problems, and that self-management coaching is possible: (1) direct feedback created by the smart technology (e.g. using a mobile device); (2) feedback from the back-end system involving more information from other sources (e.g. 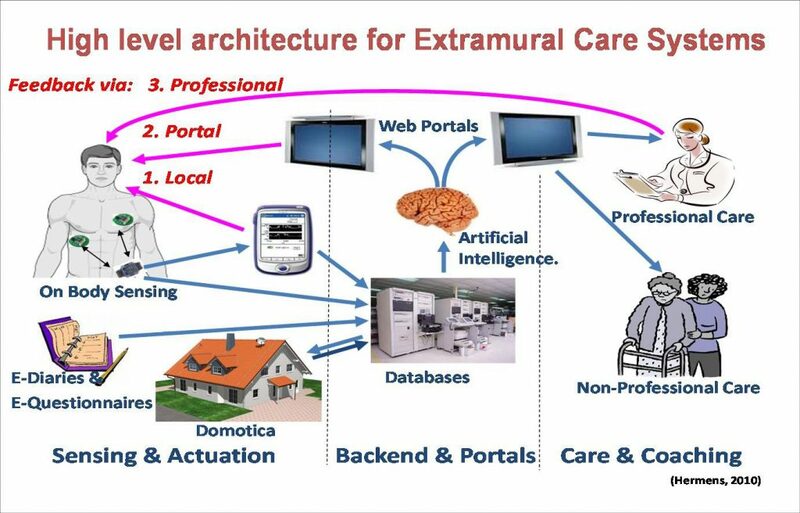 the electronic health record of other care disciplines, including decision support systems and other types of ‘intelligent’ technology); (3) feedback or other types of action from a healthcare professional or an informal caregiver acting on the basis of the data received.The general intention for CCTR is to develop technology that is, as far as possible, to the left of the figure: if possible the ‘intelligence’ and thus the advice/response should be autonomous. If this is not possible, central decision support systems come into the picture, and only if the situation escalates will professional or informal actions be required.Thinking along these lines, one could imagine that, in the future, the responses and actions in this model might be executed by a robotic system or another intelligent actuator near the patient, without a person being directly involved. This is an emerging and very challenging new area for future development, which is currently not included in the CCTR research programme, but that might be possible in the future. To enhance the integration between the three main partners, key personnel will be mutually appointed when suitable. Each project will be executed by a team with researchers from at least two of the founding organizations and colleagues form other partner organizations. A special educational programme will be developed for the PhD students. This will start from the present master and PhD programs of CAPHRI and the participating institutes at Twente University. CAPHRI has a well developed research training programme, focusing on health care innovation ranging from prevention to rehabilitation with a strong emphasis on extramural care, and covering professional as well as societal perspectives. Today more than 200 PhD students are registered with CAPHRI. CAPHRI is partner in the KNAW acknowledged national research schools CaRe and WTMC. At the University of Twente a full educational programme in Biomedical Engineering has been developed, in which two directions apply especially to the objectives of the institute, being Human Function Technology and Health Care Technology. All PhD students within CCTR will follow a common programme with elements from both existing programmes, and with free choice courses. Each year a summer school on relevant developments and general issues relating to extramural technology will be organized, open to all PhD students and interested others. PhD students will be jointly supervised by senior researchers from Maastricht, Twente and TNO QoL.